This happens every time a major disaster happens. Some crank — sometimes a more high-profile crank than others — claims that the disaster is God’s “punishment” for some perceived infraction on the part of whoever’s getting slammed at the moment. Pat Robertson once denounced my home city of Orlando because of Walt Disney World’s acceptance of gay pride events in its parks. Robertson said our tolerance would cause Florida to be hit by hurricanes. As if living between the Bermuda High and the Gulf of Mexico weren’t reason enough. This Weather Channel video does a better job of Pat Robertson of explaining why storms land where they do. I don’t know what Robertson is worshiping—this god who doles out indiscriminate punishment—but it’s not the Jesus I worship. 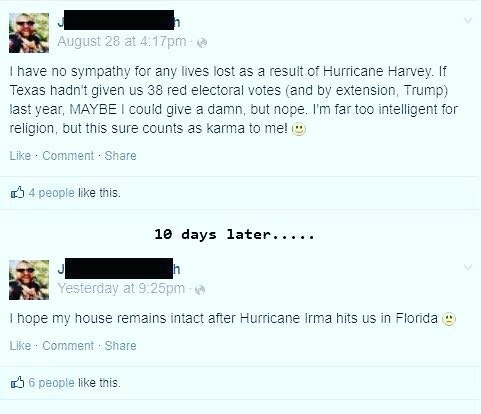 This week, some random dude on Facebook posted that Texas was suffering “karma” for having helped elect Trump—then later posted that his home was under threat from Irma. It’s too simplistic to say God sends a hurricane/tornado/earthquake/other disaster to “punish people.” Because not everyone in the path of disaster holds whatever belief or practice the accusers are objecting to. In the case of the Facebook poster, I’m sure not every person hit by Harvey was a Trump voter. Many were children. What’s the explanation for their suffering? 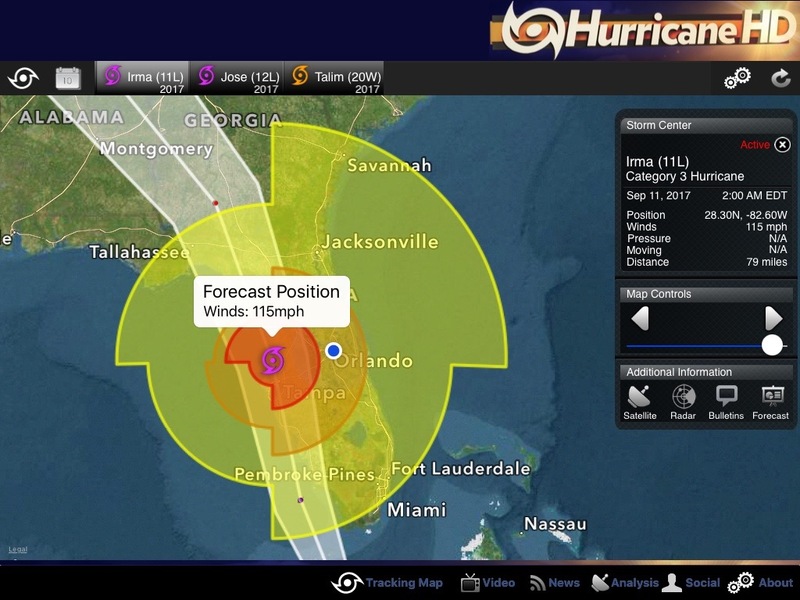 As Sunday night turns into Monday morning, Hurricane Irma is due to cross over Tampa Bay on the west coast of Florida. I have a lot of friends in that region, including NAF alumna Kat Heckenbach. My Tampa friends are all good Christian people who don’t deserve any kind of punishment from God. Well maybe they do—I know I do, and you probably do also—but the whole point of our faith is that God does not mete out the punishments we deserve for our sins, because Jesus took our punishment himself. To believe that God doles out random acts of savage nature to punish people for their sins is to deny the saving work of Christ. “Neither this man nor his parents sinned,” said Jesus, “but this happened so that the works of God might be displayed in him” (John 9:2–3 NIV). I’ve been reading When Bad Things Happen to Good People by Rabbi Harold Kushner, and I agree with him that bad things are not sent by God. They are the product of living in a broken world. If God is good, then he produces good. Though the results of a hurricane might be devastating for us humans, the hurricane has no agency and is therefore not, in itself, evil. If evil happens, that’s the work of the adversary. The apostle Paul tells us that in all things God works for good together with those who love him, who are called according to his purpose (Romans 8:28). Whatever tragedy strikes, whether storm or fire or earthquake or disease, that is not God punishing anyone. But God will use us and our reactions to those things to bring goodness out of tragedy. That’s the God of grace I worship. ← MG To YA: Why Turn To The Dark Side? I love this so much, Kristen! Thank you so much for sharing!